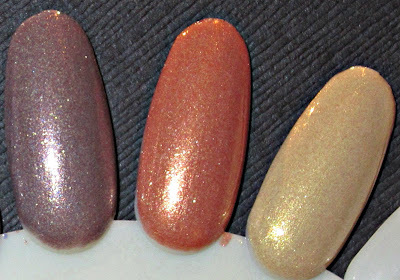 Misa's Fall 2012 Wanderlust Collection just landed, and I have a quick sneak peek of them for you. I'll be swatching them over the weekend and showing you a more in-depth look next week. It looks like a pretty Fall color collection, and includes 3 cremes with hidden shimmer, and 3 crystalline shimmers. All photos are clickable to enlarge for detail. L-R: BreakAway, Lost to the World, Frozen in Time, Live Without Knowing, Taking Chances, Epiphany. A closer look at the finish types. The photo above shows the cremes with hidden shimmer, and note that the flash washed out Lost to the World quite a bit. The shimmer in these 3 shades is very subtle. 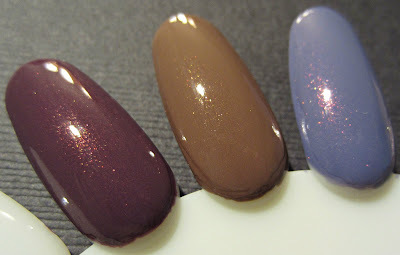 The other 3 shades have a crystalline shimmer finish, a cross between a glitter and a shimmer. Taking Chances: Everyone loves a risk—as long as it pays off in the end. But with this pale polish, a color combination of luscious peach and honeydew, forget the peril; there’s only reward. Give this mellow shade a whirl and discover the satisfaction that a calculated gamble can provide! Live Without Knowing: Knowledge can be overrated; some things are best left as mysteries—like the precise appeal of this dusky-rose greige. Maybe it’s the go-anywhere neutral tone, the saturation of color, or its tasteful sophistication. We’re not asking any questions! Frozen in Time: Life happens in a flash, but the best moments are meant to be savored. With nails enrobed in this iridescent periwinkle, you’ll forever want to stop the minutes ticking by and simply stare at your nails with unabashed admiration. Lost to the World: Destinations are definite, but sometimes wandering is a lot more fun. Tackle your next adventure with this go-anywhere tawny mauve, a delicate hue that will have you floating through the days on cloud nine whether you’re jet-setting or simply trendsetting. *Products featured were furnished by the manufacturer or PR firm for consideration. These are gorgeous! I can't wait to see more swatches and your next post(s) on them. Can't wait to see full swatches! I'm really loving BreakAway, Lost to the World, and Frozen in Time. I think Misa did really well on the names! Love the name "Living Without Knowing". Love the colours but the descriptions are ridiculously overblown! Made me laugh to read them though! Someone thinks s/he is a poet manque! It's only NP! Gosh! beautiful colors, i really like the purple and periwinkle, and totally dislike their usual cheesy descriptions.